The Azalea Stem Borer is a common pest in our area, endemic in wild populations, affecting rhododendrons, azaleas, mountain laurels and other ericaceous plants. Control is most effective by frequently monitoring plants for wilted stems, which should be promptly cut off below the infestation. If the borer tunnel is below the wilted stem, injecting the tunnel with WD40 (which displaces water from the borer larva) may arrest the damage. 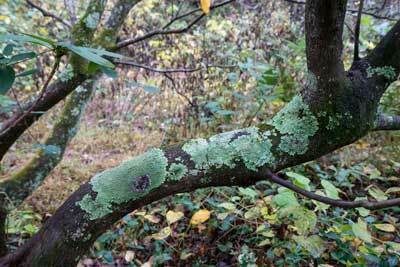 Lichen on old branches: Not a disease. 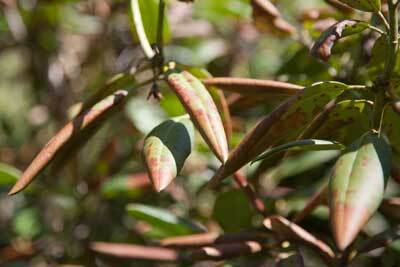 Austin Hagan,Extension Plant Pathologist,Professor, Plant Pathology, Auburn University.